WellBiz Brands Inc. has built a healthy, growing business by making wellness practices more targeted. In the process, the Colorado company has become a major player in the multibillion-dollar health and wellness industry. The Highlands Ranch-based franchise company offers three brands that focus on specific client needs. Fitness Together provides one-on-one exercise training, while FIT36 offers trainer-supervised group workouts for already fit exercisers. And Elements Massage provides therapeutic massage that matches each client with the appropriate therapist. Jervik as well as other WellBiz execs have extensive corporate backgrounds. Before joining the Colorado company in 2008, Jervik was an operations executive at Krispy Kreme Doughnuts Inc. (NYSE: KKD) and PepsiCo Inc. (NYSE: PEP), including Pepsi’s former Pizza Hut brand. WellBiz started in 1996 as Fitness Together Holdings Inc., with just the Fitness Together exercise studios, which currently include some 175 locations nationwide. WellBiz began franchising Elements Massage in 2006, and has built the concept to more than 200 locations in about 30 states. The franchise company recently added FIT36, with its first location in downtown Denver and more sites under development. The company currently employs 42 people. “With Fitness Together, it’s you and the trainer — one client, one trainer, one goal — in a 45-minute session,” said Scott Wendrych, WellBiz COO focused on Fitness Together and FIT36. Wendrych, after a career in manufacturing and operations management with companies such as BF Goodrich Aerospace, started with Fitness Together as a franchisee and then moved to FT’s corporate operation, which was in Castle Rock at the time. WellBiz franchises, depending on the brand, require initial investments of roughly $121,200 on the low end to a high of around $381,000, according to the company. WellBiz doesn’t provide financing, but franchisees can use Small Business Administration loans, 401(k) funds and angel-type investment from family and friends to fund franchises. The parent company acquires existing fitness/wellness businesses, then refines and builds them. The company bought Elements Massage from founder Michele Merhib in 2006, and since then has incorporated strategies such as making locations more upscale and conducting annual research to find out what massage therapy clients want. Based on that data, Elements is adding services including integrative reflexology, a technique that involves applying pressure to the bottoms of the feet. “Our goal is to do massage differently — to only do massage for the client, to provide the kind of massage and therapist the client wants. … Our therapists check in with clients during the massage to make sure they’re getting what they want,” said John Kutac, WellBiz COO for Elements Massage. Kutac has a management background with companies such as Western Capital Partners and Romano’s Macaroni Grill restaurants. An Elements client with a sports injury, for example, requires a different therapist from someone who wants a relaxing massage. On June 1, the brand added its Elements Promise, which guarantees that if a massage isn’t to a client’s liking, the person will get another, complimentary one. Another key to WellBiz’s success, according to the company, is finding the right franchisees, many of whom have health and fitness backgrounds. Some franchisees have corporate experience, but running a franchise business still can be a major adjustment that involves learning new management skills. “Some of our franchisees have been managers at the corporate level and now they’re managing massage therapists who work 20 to 30 hours a week,” Jervik said. Elements Massage franchisee Zach Zimmerer was in the technology side of the finance world, working for companies such as Barclays PLC (NYSE: BCS), before he went with WellBiz. 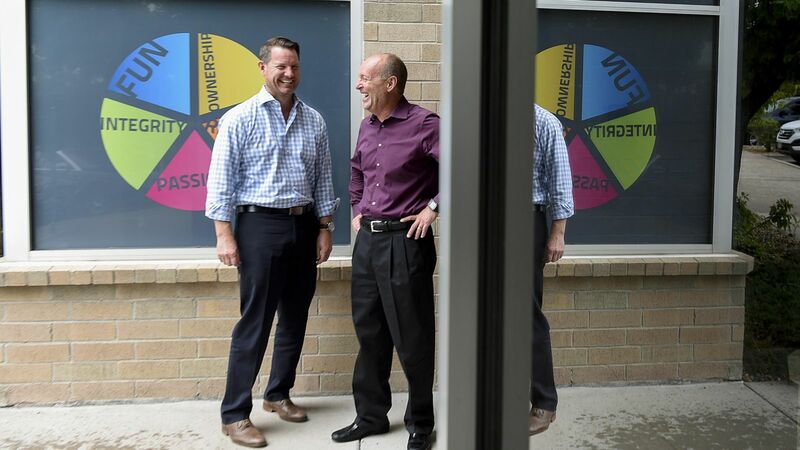 He now owns three Denver-area Elements locations and is working on acquiring three FIT36 sites.